Reliance Jio recently introduced two new prepaid recharge packs for users of its JioPhone devices. Reliance Jio provides five prepaid recharge options for its customers using its 4G-enabled JioPhone feature phones. The five recharge packs offered by Reliance Jio Infocomm - the provider of telecom services under brand Jio - for the JioPhone are priced from Rs 49 to Rs 594. These recharge packs - meant to be used with the company's 4G-enabled JioPhone devices - come with a validity period between 28 days and 168 days, according to Reliance Jio's website - jio.com. 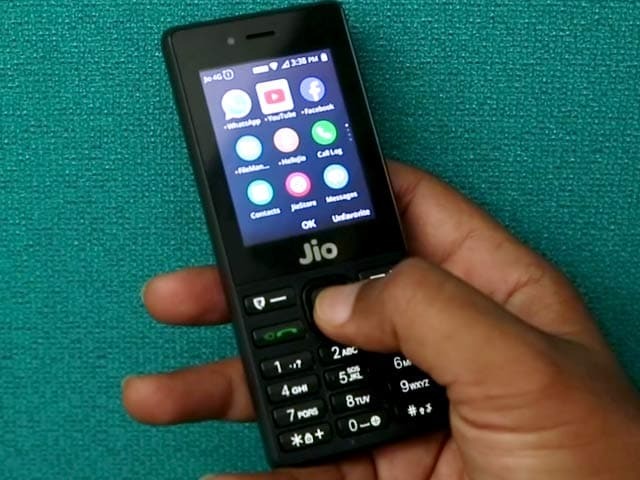 In these JioPhone recharge packs - priced at Rs 49, Rs 99, Rs 153, Rs 297 and Rs 594, Jio offers high speed data to the tune of 1-84 GBs for the respective validity periods, among other features. Out of the five recharge packs, the monthly packs of Rs 49, Rs 99 and Rs 153 come with a validity period of 28 days each, whereas the long-term packs of Rs 297 and Rs 594 have validity periods of 84 days and 168 days respectively, according to the Jio website. These prepaid plans work only if the mobile SIM card is in a JioPhone device, the company mentions. 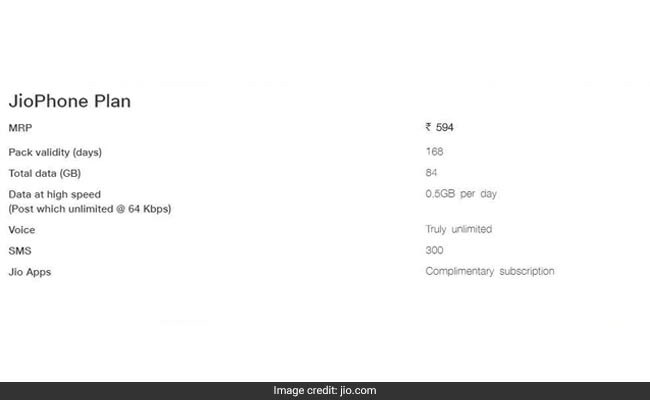 IIn its JioPhone recharge pack of Rs 594, Reliance Jio offers a total 84 GBs of high speed data with a daily limit of 0.5 GB, for a validity period of 168 days. The JioPhone recharge pack of Rs 297 comes with a total high speed data benefit of 42 GBs over a validity period of 84 days. A daily limit of 0.5 GB is applicable on high speed data. In its recharge pack priced at Rs 153, Reliance Jio offers 42 GBs of high speed data for validity period of 28 days. A daily limit of 1.5 GBs is applicable on high speed data. Reliance Jio's recharge pack of Rs 99 comes with a validity period of 28 days with a total high speed data benefit of 14 GBs, subject to a daily limit of 0.5 GB. 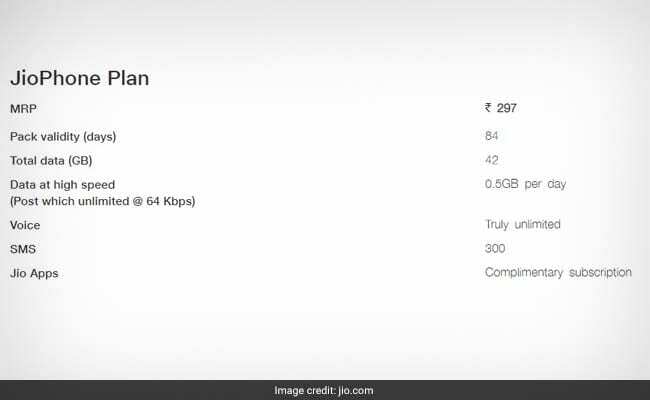 In its recharge pack of Rs 49, Reliance Jio offers high speed data of one GB, among other benefits, for a validity period of one day, according to the telecom company's website. All five of the JioPhone prepaid recharge packs come with free local and national voice calls for their respective validity periods, among other benefits such as complimentary subscription to Jio apps.